1. Cylinder mould part: the cylinder mould part is equipped with seven cylinders, main components: each cylinder is with a wire tank, a piece couch roll, a vacuum dehydration box,and guide roll, frame, etc., and share a bottom felt with 1st press. 2. Return back press part: in the wire part return back position, set the vacuum return back 1st press, the upper roll is metal roll coated with rubber, the lower press roll is the double vacuum chamber vacuum return back roll equipped with a return back press top felt. Return back press is double felt press. 3. Press part: divided into 1st press, 2st press, 3st press. 1st press is vacuum press, the top roll is metal roll coated with rubber, the bottom roll is vacuum press roll, and with top and bottom felt; 2st press, 3st press are large diameter press roll, each equipped with two coated metal roll, and with top and bottom felt. 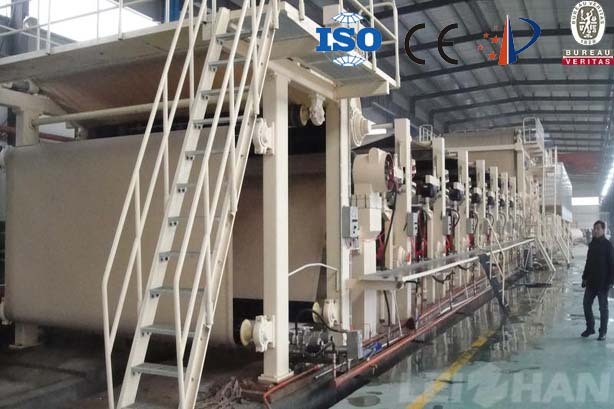 1st press, 2st press are all equipped with felt roll and felt suction box, and top, bottom felt. 1st press, 2st press, 3st press pressurized type is corrugated tire pressure. 4. Drying part: Φ1500 / Φ1800 dryer cylinder, sub-drive, with guide roll, wire leading roll. It is equipped with semi-closed hood. 5. Reeling part: Pneumatic Horizontal Reeling Machine.